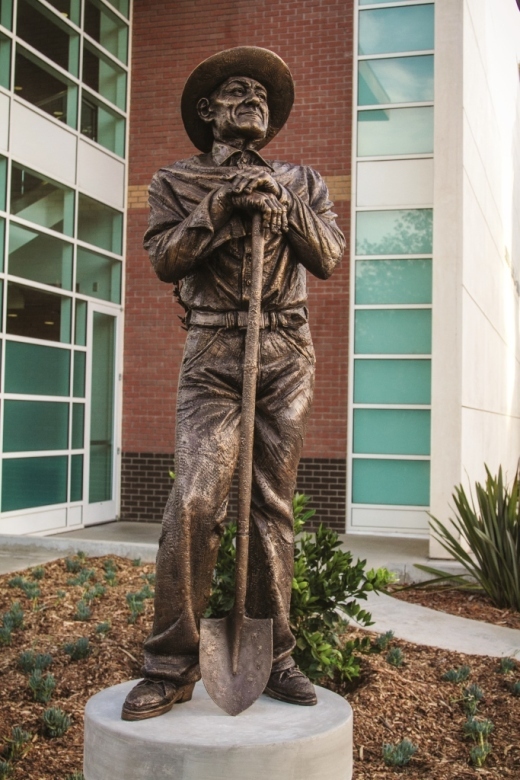 After five years in the making, a bronze statue of the farmer who donated his land for the California Lutheran University campus in Thousand Oaks will be dedicated at 11:30 a.m. Saturday, April 18. The statue of Richard Pederson, a son of Norwegian immigrants, will be dedicated during the Scandinavian Festival, but the site will be accessible to people who are not attending the event. The statue stands next to Soiland Humanities Center near the flagpoles on Memorial Parkway. The ceremony is free and open to the public. Cal Lutheran President Chris Kimball will preside over the event. Pederson’s niece, Janet Pederson Reeling of Bishop, plans to attend. While serving as an artist-in-residence during Cal Lutheran’s 50th anniversary in 2009, Paul Lucchesi of West Virginia decided to sculpt a statue of Pederson based on a black-and-white photograph of him looking out over his ranch. With the statue now at the top of an incline near the center of campus, Pederson will forever look out over the university he made possible. The original clay sculpture sat in storage until last spring, when the Cal Lutheran Community Leaders Association, Artists and Speakers Committee and University Advancement paid for Lucchesi to return to campus to create a wax mold and prepare it for casting in bronze. Pederson had been ready to retire a bachelor when he donated his 130-acre ranch in 1957 so California Lutheran College could be built. The ranch’s chicken coops were converted into the first offices and classrooms. Classes began in 1961 with 330 students. Today, the university has 2,800 undergraduate and 1,350 graduate students who come from around the world and represent a diversity of faiths and cultures. Pederson’s parents, Lars and Karn Pederson, had paid $3 an acre for the ranch land and $2 an acre for the hillside in 1890 when they became one of the founding families of the Norwegian Colony. After Lars Pederson died, the family moved to Santa Barbara, but Richard and his brother Peder returned in 1913 and their mother later joined them. They lived in a Sears, Roebuck & Co. catalog kit house, which today is the home of the Music Department. They grew alfalfa, hay, tomatoes and grapefruit and raised chickens, selling about 9,000 eggs a day. Pederson died in 1976 at the age of 81.